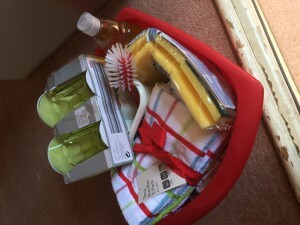 For several months we have been collecting items of personal hygiene and toiletries for mothers and babies for the women who arrive at the Ashford women’s refuge with nothing apart from what they stand up in. Nappies of all sizes and wipes for the youngest children and soap, shampoo, pants and tampons for the mothers are the basic essentials but all kinds of toiletries are welcomed. When we made our most recent delivery their cupboard was almost bare so they were very grateful indeed for your gifts. We will continue with this practical expression of love. 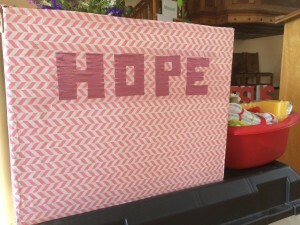 We may now deposit our gifts in the big plastic box in the corner of the church that used to be used for the food bank collection. At this visit we also discovered that they now need to equip five small kitchens ready for any new intakes. We have started with washing up bowls and washing up liquid and now need to think of those other items that are essential in a kitchen. For example: brush and dustpan, mop and bucket, dish mop, baking tins, mugs, bowls, cutlery, tea towels, tin opener, saucepan, etc. Your generosity is overwhelming! After only two weeks we have a box full to deliver that will be for the first kitchen in case someone needs it quite soon. And we are well on the way to the other four! Thank you.